We are currently SOLD OUT of exhibitor space for the 2019 Chicago Antiquarian Map Book & Ephemera Fair. If you would like to be added to the wait list for the fair, please fill out the registration form below. Welcome to the exhibitor registration page for the Chicago Map Fair at the Newberry Library. The fair will take up much of the newly renovated first floor at the library, which gives us with the opportunity to provide a unique variety of booth setups to fit you needs. If you wish to set up as a dealer at the 2019 fair, please fill out the registration form below. 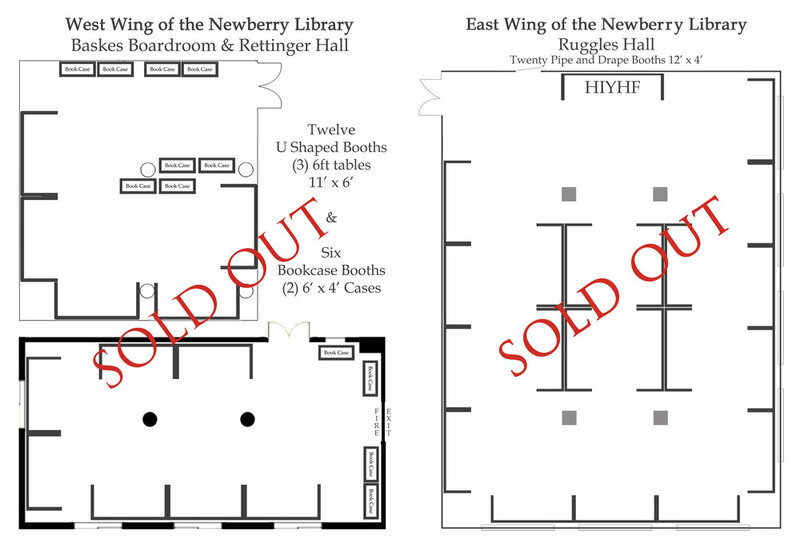 Located in the East wing of the building, Ruggles hall is the largest of the three rooms and will hold the most dealers in one space. The booths will be 12 ft x 4 ft x 8 ft (width x depth x height) with a pipe and drape setup. All hanging materials, track lighting, signage, electrical, trash bins, tables, and linens are included with the booth rental. Print racks and glass bookcases are available for rent. Just request them in the form below. Located in the West wing of the building, these rooms are smaller than Ruggles, but when combined, are nearly the same size. These rooms will have two booth options. Option 1 - Table top booth consisting of three 6 ft tables to form an 11 ft x 6 ft U-shaped booth. Table top bookshelves, signage, electrical, trash bins, tables, and linens are all included in the booth rental. A pipe and drape backdrop with hanging materials or a large bookcase can be added upon request for an additional $250. Option 2 - Glass Bookcase booth consisting of two wall display cases with lighting and locked doors. An addition case can be rented for $400 if there is enough room. Both bookcases and booth signage are included in with the booth rental. I would like to share my booth with another dealer. If sharing a booth, please indicate with whom. Flat rate for color or black and white advertisements. Any donations go directly to HIYHF school programs. Thank you! We will be in touch shortly to confirm your responses and issue a contract.